Directory Manager is long established as the mechanism used by NHS IT teams to harness data from ESR to manage the creation and update of user accounts in Active Directory. 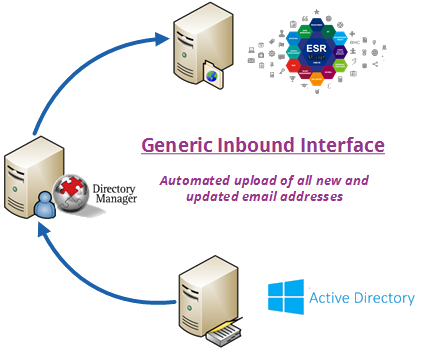 The ESR integration module in Directory Manager has now been extended to provide a two-way relationship between Active Directory and ESR, facilitating an automated update of staff email addresses into ESR using the new Generic Inbound Interface (GII). Whether using Directory Manager to manage mailboxes in Exchange, or to integrate NHSmail with the local Active Directory, the software can now pass the respective email addresses to ESR for all staff. This overcomes a number of issues for HR teams, who in addition to needing validated email addresses in ESR for communicating with staff, also need this information to enable self-service features in ESR. If your NHS organisation has Directory Manager and would like to implement this facility, or if you have yet to deploy Directory Manager, please get in touch with BDS Solutions on 01884 33440 or info@bds-solutions.co.uk.